I first heard the Lost Bayou Ramblers a few years back at Festival International. I was doing an assignment for afropop.org and interested in some of the international artists performing there. I admit to having preconceived ideas about cajun music, that changed when this band began playing. The audience responded instantly to the spontaneous fun from the stage, but it was the music that grabbed my attention. It sounded more like Stiff Little Fingers or The Pogues than the cajun music i remembered. The show at Sunnyvale, and the words he shared with us after are an extension of what Louis and his brother Andre have been doing since they were teenagers playing in Les Freres Michot, their uncles’ family band. The Sunnyvale shows September 29th, were shoehorned into the space between an afternoon gig headlining the Chili Pepper Festival at the Brooklyn Botanical gardens with the Lost Bayou Ramblers and an appearance the next evening at Preservation Hall in New Orleans french quarter. Brooklyn Fans who responded to a Louis Michot email announcing the gigs heard The Michot’s Melody Makers burn through a set of cajun standards followed by another of his projects, The Stoned, an open ended improvisational jam session where he was joined by New York based friends, recreating the energy of Michot brothers residency last year at The Stone, John Zorn’s east village venue. The Melody Makers set began as does “Blood Moon” with Two Step de Ste. Marie, driving drum pad beat introducing Louis’ violin and reverb doused vocals It is a song written by two of his uncles, Rick and Bobby, of Les Freres Michot about their mom, Patricia. The set moved to a cajun blues song “Dans Les Pins” a standard played as a droning blues that harkened back to Leadbelly’s “Where Did You Sleep Last Night”. While most of the set and album originated with legendary local artists such as Leo Soileau, and fiddle music such as Danse Carrée, it also included a cover of an electronic/hip hop number “La Lune Est Croche” (The Moon Is Crooked”) recorded by Le Peuple de ‘lHerbe of Lyon, France, co-written and featuring vocals by Louis. The Stoned set was primarily instrumental. Michot referred to the Stone release as “a 45 minute cosmic-cajun improv session”, this live set followed suit. Featured guests Stuart Bogie on sax and Ryan Brasseaux on triangle joined the Melody Makers . Broader and more atmospheric, Bogie’s playing brought in R+B textures. ” Vocals as well were free floating. Michot even introduced the audio from a cajun Star Trek parody by local humorist Ash Reese into by his phone plugged into a jack. During the interim Louis will devote time to Nouveau Electric Records. “I have wanted to start it for many years, the whole platform is that there is so much amazing music around here that does not get a voice because it doesn’t fall into the traditional cajun or zydeco genre or doesn’t really fall into any genre, so i am trying to give a voice to all different kinds of musics.” He said. Lakou Mizik jamming with the Lost Bayou Ramblers at the Blue Moon during Festival International. Eric Heigle of LBR later produced and mixed music for the Haitian band’s upcoming album HAITIANOLA. The event was a record release of “Blood Moon” from the Melody Makers on Sinking City records and “The Stoned” L.E.S. Douze vol.1, a 45 minute live recording from the residency. Louis The music on both extended Michot’s interest in the exploration of early cajun music merged with experimental and improvisation. Nouveau Electric, his new label, is aiming to bring non traditional and lesser known artists of south Louisiana to a wider audience. The choice of material harken back to the days when cajun music was not amplified, before drum kits or accordians were the norm. But listeners need not know the historical origins of the music to feel it, the music is transformed in the hands of the rhythm section, drummer Kirkland Middleton’s drumming and Bryan Webre on bass and samples along with guitarist Johnny Campos. They create an affecting musical space that complements the raw emotion of Louis’ vocals and rakish violin cajun melodies. We spoke with Louis by phone a few days later. He was in his truck on hwy 93, driving from Grand Coteau to meet the band and head to the Texas Rice Festival. 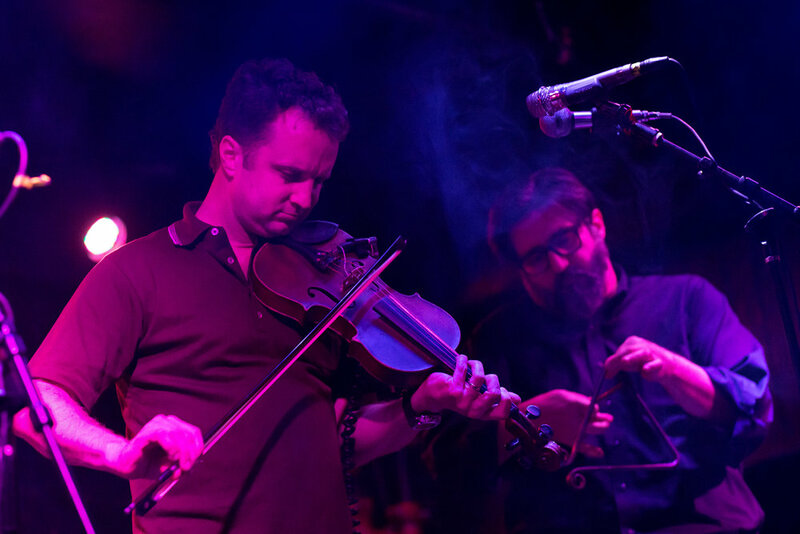 The Lost Bayou Ramblers are just now getting to take a hiatus after 20 years. It was planned for January, then their album “Kalenda” won the Grammy for Best Regional Roots Album, which led to another six months touring. The Rice Festival in Winnie Texas was the last stop. The next release will be Ethel Mae Bourque a singer known only locally, Louis made field recordings of her in her home. The Michot Brothers knew her dad, Sydney Bourque, growing up. Louis describes Mr Bourque as a quintessential man of the land, speaking only cajun French and growing his own food. Ethel Mae lived on the Vermillion River near Maurice and preferred not to leave her home. She did evacuate before Hurricane Gustav to Arkansas and died while away. Louis and Andre Michot at a LBR gig at the Blue Moon in Lafayette, Andre will be touring withTake Me To The River - A Celebration of New Orleans Music feat. The Dirty Dozen Brass Band, Ivan Neville, Ian Neville, George Porter Jr., Big Chief Monk Boudreaux, 79ers Gang & Terence Higgins in New York Oct. 25th. 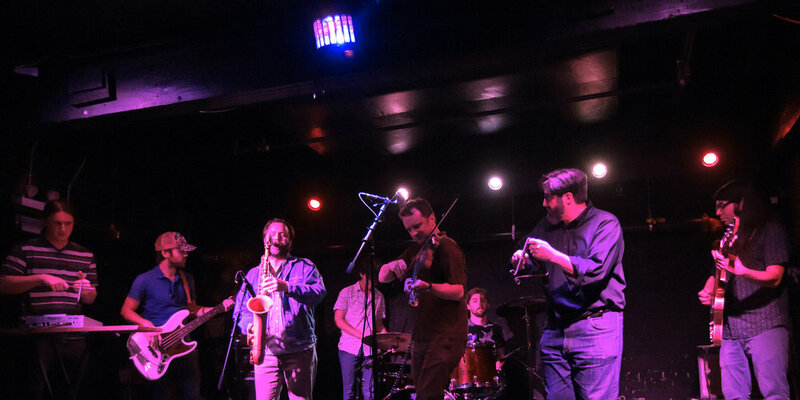 Until the Lost Bayou Ramblers return, Louis will be performing regularly in New Orleans and south Louisiana with the Melody Makers.